Evergreen and Ever-Interesting Shrub Collection. Hedging Plants, Trees, Shrubs and Conifers. Bottom: Photinia Red Robin & Viburnum tinus. Many evergreen hedges/screens, especially some varieties of conifers, have little seasonal change, but this collection will give contrasts and interest throughout the year. In May the Berberis darwinii will burst into flower with its rich orange flowers, closely followed by the large bunches of white flowers on the Cotoneaster franchetii which are particularly attractive to bees. Then in June Pyracantha Orange Glow will produce many clusters of white flowers which contrast well against the shiny dark green leaves. All the year the Photinia fraseri Red Robin will enliven the hedge with its splashes of red on the new foliage. 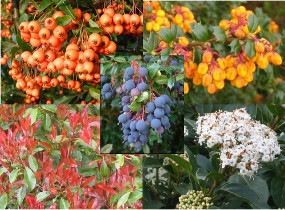 Come autumn, bunches of bright orange berries will be found on the Pyracantha, red berries on the Cotoneaster and blue-black barberries on the Berberis. The barberries you can eat or leave for food for wildlife; and eventually all the other berries will provide more food for birds. During the winter months Viburnum tinus will be displaying its flat heads of white flowers which have opened from pink buds. We may occasionally substitute equally suitable plants in this collection. A collection of 5 plants covers a length of approximately 3.5m (10ft).